With environmental issues climbing the agenda of many racing businesses, Pontefract Racecourse want to play their part in providing a sustainable future for generations. That’s why in 2019 they are aiming to send zero waste to landfill. What will the course be doing differently in 2019? The Racecourse has partnered with Wakefield MDC waste management depot to remove all their waste to a sorting depot. The waste will be sorted to ensure that everything recyclable is recycled. Anything which cannot be recycled is broken down and used in alternative sustainable methods. The Racecourse’s caterers, CGC Event Caterers Ltd, have also taken some big steps to become more environmentally friendly, sourcing both local and recyclable products. This approach ensures products are of the highest quality and that the way in which it is served is environmentally responsible. To complement the waste management and recycling campaign, the Racecourse has commissioned a local artist, James Owen Thomas, to create four pieces of artwork. 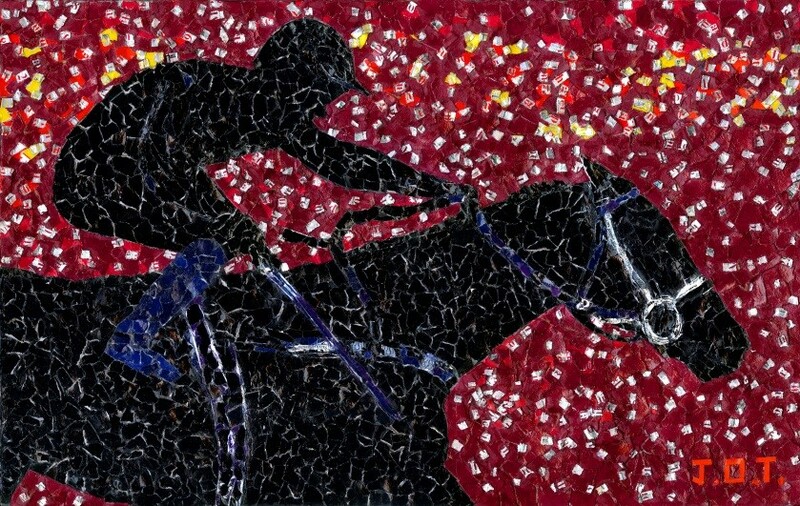 Each piece of the mosaic and collage artwork is made entirely from old badges, tickets and marketing materials from previous racedays and created on recycled canvases. These four pieces of stunning artwork will be displayed at the Racecourse throughout the 2019 season and recreations of these fantastic racing depictions have been used on the covers of each piece of marketing literature used to promote the season. In addition, all of the marketing literature at the track has been printed on FSC (Forestry Stewardship Council) paper. This ensures that the supply of the paper is from a replenished source and is environmentally friendly. Ponte James Owen Thomas, 17, started creating art three years ago using discarded scratchcards that he found around his home town of Pateley Bridge. Since then, he has honed his talents and has increased his collection with breathtaking collages of Fountains Abbey, Knaresborough and Ripon Cathedral. Each piece of his commissioned artwork incorporates a lottery card ‘horseshoe’ or similar symbol as a reminder of his original inspiration. Using hole-punched circles, cut strips or torn pieces pasted layer upon layer, James’ innovative and ground breaking artwork has achieved a huge amount of praise. James is currently studying at Bradford School of Art. When time allows, he supports charities such as the National Autistic Society. Having been diagnosed with autism at the age of 3½, James has faced a number of challenges during his life but sees his autism as a gift as it gives him the strength to be different. 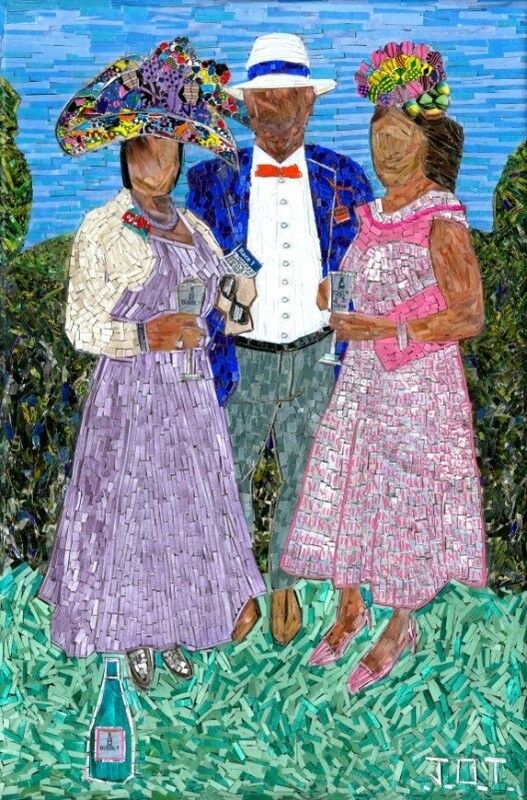 Taking inspiration from renowned Yorkshire artist, David Hockney, James is quickly establishing himself in the art world and has been exhibiting his growing collection for a number of years. This exhibition can be seen at a number of locations throughout the country during 2019. 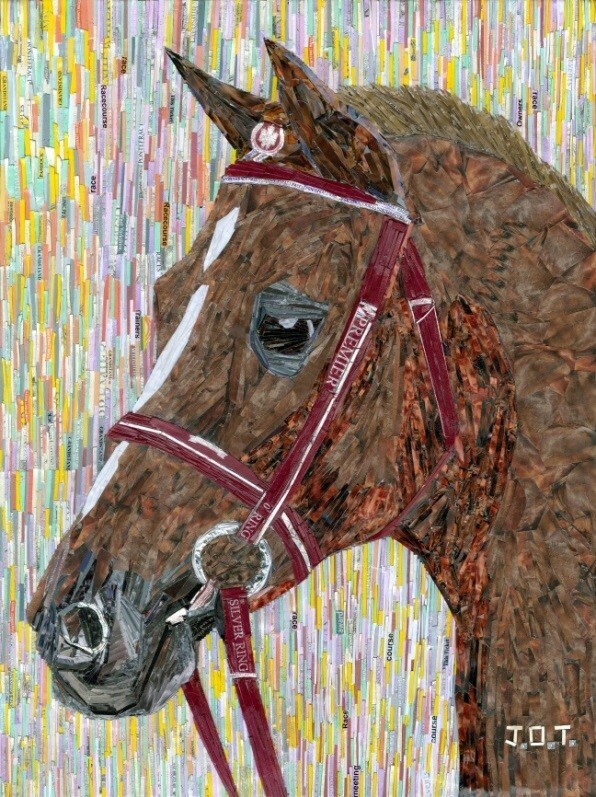 The collection of James’ artwork for the Racecourse will be unveiled at the annual Press Lunch at the end of February and racegoers can view the art at each race meeting during the 2019 season.